Our Preschool opened in 1996 and offers 3 environments with two classes in each. 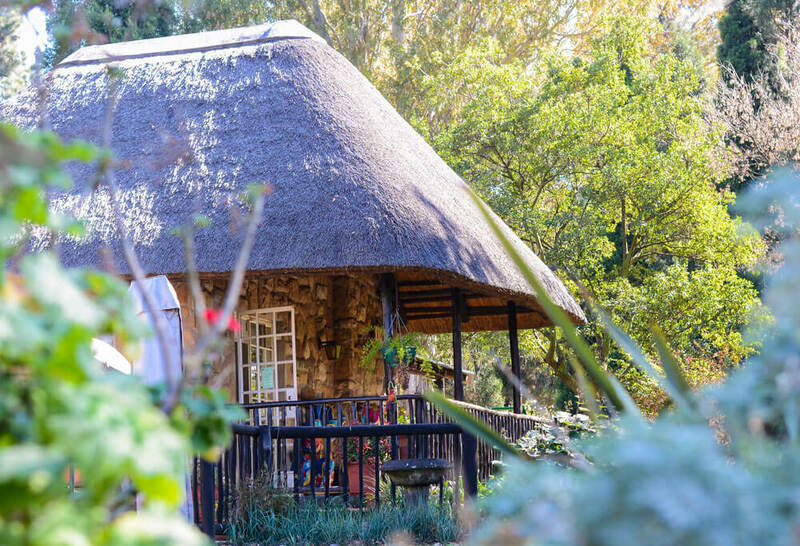 Casa de Bambini (Children’s House), The Potting Shed and Elephant Cottage encourage smaller communities with a ratio of 11 pupils per adult, which adds to the feeling of a country school. 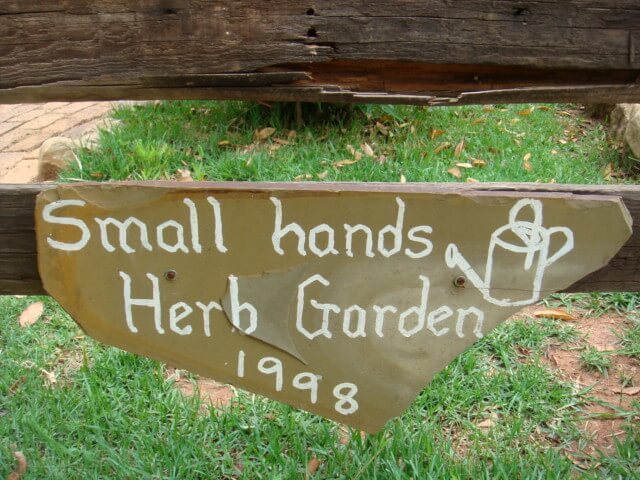 Each environment is fully equipped with Montessori equipment as well as a playground and ablutions. Teachers are qualified with 3 – 6 year old Montessori diplomas and follow the international Montessori Method. Our 3 year course allows pupils to enter primary school with a lovely exposure to Mathematics, Language and knowledge of the world. Between the ages of birth and six years old, the child possesses an “absorbent mind”. During this time the child learns their home language, perfects movement and internalises order. Maria Montessori also observed “sensitive periods” in the child where the child is especially sensitive and acquires certain knowledge and skills. These periods occur universally for children at about the same age providing the time for optimal development of a particular skill or knowledge e.g. language. The preschool and primary school environments have four main areas in the programme with the aim of helping the child to grow as an individual, appreciating the larger context of their world. The Practical Life area is the link between the home and the classroom. The child’s desire for order and independence is expressed through the use of materials and Practical Life includes – Control of Movements, Care of Person-e.g. how to button, Care of Environment e.g. sweeping and Grace and Courtesy e.g. manners. In the early years children in the preschool develop a sense of order and actively seek to sort, arrange and classify their experiences. Sensorial equipment gives the child experience initially in perceiving distinction between similar and different things. The child will later learn how to grade a set of similar objects that differ in a regular and measurable way. Precise language such as loud/soft, long/short, rough/smooth, describes these sensorial experiences to make the world meaningful. Maria Montessori believed that by exposing children to songs, games, poems, stories and classified language cards they become immersed in language, writing, reading and spelling. The child is led to abstract ideas and relationships by working with the concrete materials like the Number Rods and the Golden Beads. The golden bead material highlights the numerical, geometrical and dimensional relationships within the decimal system. 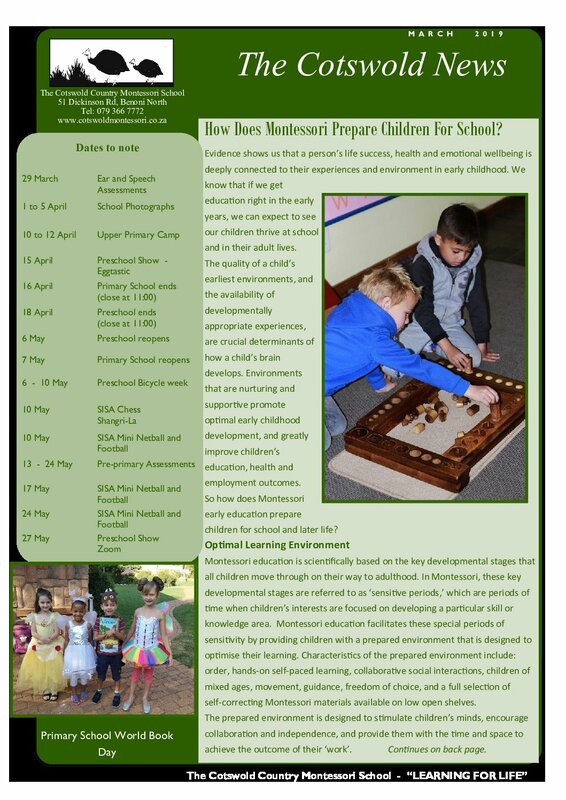 Geometry, algebra and arithmetic form part of the Montessori math curriculum. Through concrete materials the child learns to add, subtract, multiply and divide and gradually comes to understand many abstract mathematical concepts. Movement to Music, Preschool Athletics, Mini Tennis, Soccer, Drumming. Ballet, Tap, Modern Dancing, Speech and Drama, Eisteddfod, Concert, Art and Crafts. The Cotswold Country Montessori School also offers safe and secure Aftercare facilities and a Study corner in which children may work under the guidance of a teacher. Aftercare is available until 17H00 every school day. It is open during school holidays. 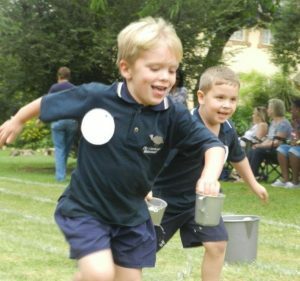 The Cotswold Country Montessori School offers parents the services of a Vacation/Holiday Care Programme during the preschool holidays. This programme is run by the schools preschool staff over a full day and various fun activities are planned daily for the children.